Closed Circuit Television is primarily used to prevent crime (although critics say that criminals simply pick places which are out of range), but CCTV cameras also been used by employers wishing to check up on staff or ensure that customer service is up to scratch. They may be an intrusion on privacy, but they're now a fact of life. 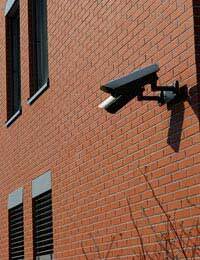 CCTV is permissible in public areas including shopping malls, motorways and housing estates. CCTV cameras have become more advanced in recent years and it can now isolate and track identified targets, recognise number-plates, and eavesdrop on conversations. CCTV has spread in the last few years. CCTV cameras are now used not only on motorways, where you’ll receive warning about upcoming cameras, but also on cash machines, housing estates, and car parks. Regulations require that, where CCTV is used in a public area, there is a sign providing information for contacting the camera operator. These signs should be made visible when you enter a camera-monitored area. Like other forms of technology CCTV is becoming more and more advanced. Work is underway to enable CCTV cameras to recognise types of behaviour that have been associated with criminal activity. This catalogue might include, for instance, shouting, pointing, or erratic driving. Cameras are already able to recognise an individual face and track it; the camera will communicate with its network in order to track one person as far as the network reaches, which has raised the hackles of some privacy advocates. What are your Rights Regarding CCTV? Quite simply, you have no right to prevent cameras from recording your movements and behaviour. The camera’s owner is permitted to install one or several cameras and keep an archive of footage that may include you, but (s)he may not use the footage to obtain information about you personally, or to observe your behaviour. In 1998 the Data Protection Act outlined the responsibilities of those using CCTV. However, because the DPA was designed to protect individual privacy, its guidelines do not apply to all CCTV cameras. Provided you can show that you are not using the camera to analyse the behaviour (and invade the privacy) of any one individual, then you are entitled to put a CCTV camera anywhere on your premises. If, for instance, the owner of a small newsagent installed a CCTV camera above the till and recorded everything to a tape in case of robbery, this would not usually be relevant to the DPA as it does note violate privacy. In a domestic context, invasion of privacy is in fact not an issue that affects privately owned CCTV. It is only an 'offence' under the Human Rights Act and that act only applies to the State. i.e. The Government, local government, police, parish councils, Health Care Trusts etc. In other words, an individual cannot infringe the human rights of another individual - in this case, the right to privacy. A common scenario of privacy invasion using CCTV is when someone uses CCTV cameras to view their neighbour's property. As this is not actually an offence, the police will usually have to resort to using the Harassment Act to resolve the matter. However, where CCTV cameras are installed specifically to monitor behaviour, identify potential criminals and track individuals, for privacy purposes they must be registered with the Information Commission. These cameras are subject to the DPA. The DPA ensures that footage is reasonably captured and kept; it should be viewed by a designated staff member and not made widely available. The DPA also requires that the footage be made available to its subjects, where appropriate, and if requested. If you have installed CCTV cameras that will be subject to the DPA (i.e. you’re capturing information of certain individuals) then you can read the Information Commission’s Good Practice Guide online. Hi, Briefly to keep in short - my neighbour and I have a shared driveway and boundary and had a dispute as I spotted him shining a torch over our fence into my property on my CCTV late one night. I wrote a letter and asked him to desist as he was upsetting the ponies and scaring me as this happened in the dark. . My CCTV is sign-posted and very obvious and looks only towards my own land and is there to protect a small stable block and farm machinery which Icannot see from house due to the layout of my property.He then erected 3 cameras that I only found out about due to the red lights showing on their night vision.Two fixed cameras look directly over the boundary into my property and the other one, a PTZ black dome, is currently looking up onto my kids riding field.I am at a loss to know how to deal with the intrusion - his cameras also have audio and one is literally 6 feet away from my back door.He will not hear anything nice about himself that is for sure.I had assumed that any footage of crime on his property would be inadmissible as evidence as he had no CCTV signs and that he was not supposed to film directly at my home.Can you advise please? Hi, I am a motorcycle instructor and haveasked to follow my trainee and record the test while being tested by the examiner. My decision to do this is to simply provide perfect feedback regards the test. the normal motorcycle test Mod two involves the rider being followed by the examineron a motorcycle being guided by radio. I was informed by the examiner that if i film the test he will terminate the test? my question is simple, if i am able to film in public without fear why and is it unlawful to film a motorcycle test ? Question. I have been suspended by my employer pending investigation for somthing I catagorocally deny. However they say there is cctv from an industrial site that was watching me. The cctv and industrial site has no link to my job at all. Can they obtain this “supposed” footage? @Popeye - dashboard cameras naturally point outwards as they film other traffic - I think you're being a bit paranoid here. I imagine it's just the way the car is parked and the neighbours haven't even noticed. My neighbour has installed a cctv camera in the communal hallway between our 2 flats. Although we have a security operated main door to the block, there is a separate entrancedoor to our two flats with a small shared hallway. Is she in breach of my human rights to privacy? I attend a club as a commity member i have been made aware that the secutary has had cctv installed and watches it from home and dose not have her own office on camra is it right to be able to watch it from home ? Hi I have been told that there is cctv footage of me in a pub which resulted in a fiscal Fine I have been told that the Landlord has shown members of the public the cctv footage of me Surely this is not allowed? Can I do anything about this? I do not understand why blacked out dome camera's are legal for domestic use. As one one person points out on hear, this gives someone the freedom to legally invade you're privacy under cover. It also makes it difficult to police the situation given that the user can remotely change the direction of the camera at will without you're knowledge. This is a gift for a Pedephile and we must be able to protect our children. I am sad to say given the age we live in, one must always assume thatsomeone may be using CCTV for sinister purposes if they are using a camera that conceals the direction of the lens. This is if they are capturing images that are outside the boundary of their property. If a camera is capturing the activity of a neighbour it is not good enough to simply say that they can do this if they can prove that are not using it for good reasons. If someone wants to protect their property in most cases it is not necessary to point the CCTV camera outside the boundaries of their property and it should be against the law to do so, period!. I conclude that the rules surrounding the use of CCTV for domestic use are simply advisory and discretionary and there needs to be new strict laws that protect people against the abuse of CCTV for domestic abuse. Depending purely on the human rights act is not good enough . A neighbour has recently installed a new kind of CCTV camera which is uncased in a black dome making it impossible to see where the camera lens is pointing. I was really shocked to discover just how little protection there seems to be when it comes to the use of camera's for domestic use. Everything is advisory and nothing enshrined in law which means that even if a neighbour is pointing their camera at you're window the only powers the police have to stop it is through the human rights act to privacy. @Marvin - but it can also help too. CCTVs have caught many criminals - so it is there for your protection - but I see what you mean - as it is a massive intrusion too. I am beginning to dispair about the amount Intrusion in my personal life that CCTV and other technologies allows.The moral case for crime control and yes prevention is undeniable but! Yes there's always a but, the degree of possable! Intrusion that technology offers is staggering. From switching on your TV'S? microphone/camera, your phone also to being recorded siting in the backseat of a Taxi. Where will it stop? Legislation dose not attress the balanced use of these technologies, governments need to address this issue now! And set limits and safeguards for us all. P.s. Rember humans have a very poor history regarding the use of technology we always find ways of misusing it, this time will be no different we need to control it NOW!! Hi There I live in a communal flat owned by social housing. My home is above the communal bins and for over four years have suffered with antisocial behaviour with flytipping and littering. The landlord installed cctv inside the communal bins, promising to stop the ASB by monitoring the CCTV as the smells from the bins are severely affecting our home and health. Since the camera was installled in February 2016, nothing has changed. I asked the landlord if we could view the cctv to find out who was doing this to us as the matter was worsening but the landlord refused. They refused due to data protection, despite the fact I contacted the police to report the nuisance behaviour affecting our home and health. But the landlord has lied to authorities including the police and MP saying they monitor the CCTV every week and the flytipping and litter is picked up as soon as it is spotted. Which is untrue as we take pictures every week to prove otherwise. The landlord also,said the cctv is deleted automatically after a few days. Previous to this, the other CCTV cameras installed inside the communal hallway and entrance of our building were dummy/fake cameras which was confirmed by staff by denied by management. Do I have a right to view the footage if any available due to the ASB continuing? Thanks. Really, the only thing you can do is ask the neighbours politely to avert the camera from your living room window, likewise draw attention to the fact their security light is invasive. However, as specified in the article this is not actually an offence, if your neighbours can show they are not using the camera to analyse your behaviour and it is used for security purposes. If you think the camera has been placed to monitor your behaviour and/or they refuse to re-position the camera at your request, then if you feel strongly about it, you may request a second opinion from the police. i work and live at a private members club and we have CCTV installed i have been frequently watched to monitor my behaviour and on an occasion when i was playing on the machines at the end of my shift whilst waiting for members to leave this was addressed with me i asked for the secretary or president to put their findings in writing but they refused and also in my own time i was watchedwhilst having a sociable drink with members in my 4 hour break this was later used against me and i was not allowed to attend work, im feeling like i live in a big brother house and don't know what i can do. Can you give me any advice please? Can cctv cameras be used by an employer to watch workers to see if they are doing the job correctly? My neighbour parks his car across the end of my drive and after a recent allegation of his car being hit by a visitor to my premises has set his dash cam running 24/7 onto passenger side door window pointing straight down my drive and this also into my garage and side garden. I understand he wishes to ensure his property is safe but this is directly monitoring my young and ground from my address. If do example he set his camera up at his front door it would be pointing away from my house at 90 degrees and still show the length of his car and down into the close not into and on my property. Has he over egged it and infringing my rights if so what can I do to protect my own privacy ? A local primary school has just been rebuilt and one of their new entrances is a few metres opposite our back gate. CCTV cameras have been installed. At the very least I imagine these will monitor the rear of our house. Is this considered an invasion of privacy and what can be done about it. Thank you. Hi, A few questions. We have a caretaker of residentional flatswho looks at the CCTV footage every working day. A few questions. Does the Managment Company need a licence? The caretaker has put up a notice stating that she is checking the CCTV to find out if people are smoking in a certain area is this legal? The caretaker uses the CCTV to tell residents off for small descrepencies.What can we do to stop this behaviour? I recently went to a local pub and was accused of being in a fight. I know that the cctv will show differently. Since the landlord has been discussing the situation with other people and making up stories. Do I have the right to privacy?As I have not committed any crime and if so how do I go about making the landlord stop spreading rumours and using the cctv as a scapegoat? @Crow - as specified in the article you are entitled to have CCTV, provided you can show that you are not using the camera to analyse the behaviour (and invade the privacy) of any one individual. It sounds like this is a gross invasion of privacy. I have included a link to the ICO which is the the UK’s independent authority set up to uphold information rights in the public interest, promoting openness by public bodies and data privacy for individuals, link here. You can report a concern on its free helpline 0303 123 1113. I hope this helps. I frequent a private members club and there is cctv on the premises. My concern is that the former secretary openly admits to watching this cctv in his home and also listens to conversations too, is this legal?